Due to circumstances beyond our control, this event is CANCELLED. We encourage you to get into the holiday spirit by attending our annual performances of Amahl and the Night Visitors. Click Here to purchase tickets. Find PEACE, treats, and treasures at our holiday bazaar featuring local vendors. 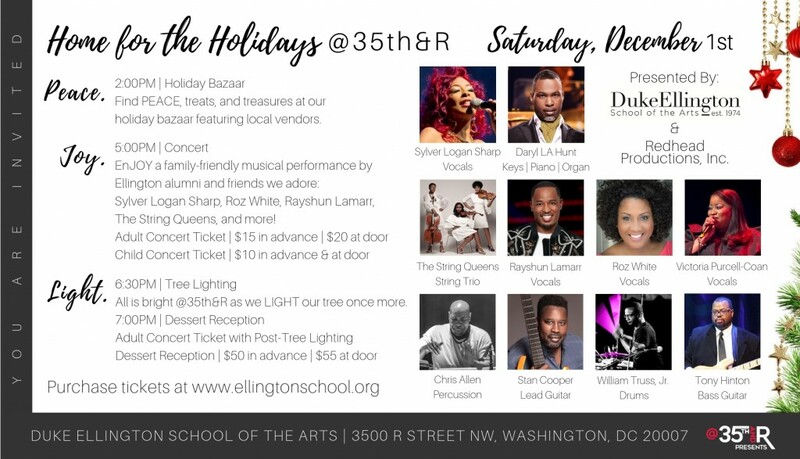 EnJOY a family-friendly musical performance by Ellington alumni and friends we adore: Sylver Logan Sharp, Roz White, Rayshun Lamarr, The String Queens, and more! All is bright @35th&R as we LIGHT our tree once more. Purchase concert tickets here. Vend at the holiday bazaar or become an event sponsor here. See you there!